The Cholsey & Wallingford Concert Band is a friendly band based in Cholsey, near Wallingford. Our current repertoire includes classics from Mozart to Holst, traditional and modern marches, film and show tune favourites. 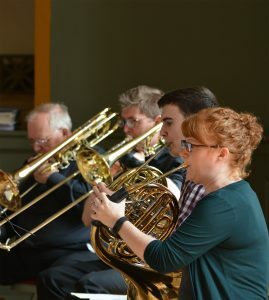 We rehearse on Monday evenings at 7:45pm in the Great Hall, Cholsey Meadows, nestled between Goring on Thames and Wallingford and within easy reach from South Oxfordshire and Berkshire. Take a look at our calendar for rehearsal dates. We are looking to welcome new members who can play to a high standard and are committed and reliable. Woodwind, brass, string bass and percussion players welcome! In particular if you play Tuba, Trumpet, Saxophone and drums we would love to hear from you. At present we are looking for Tuba, Saxophone, Horn, Trombone players and a Drummer. We are a friendly group of people so if you’re interested in joining us then please get in touch. We’d love to hear from you! 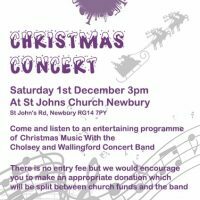 It’s our Christmas concert on the 1st December, 3pm at St John’s Church in Newbury (St John’s Road, RG14 7PY). Please come along and listen to some festive music to get you in the mood for Christmas. Sat 2nd Feb 2019, musical concert in the Great Hall, Cholsey during the evening. More details will be available nearer the date, look out for more information. We are available for many types of gigs including business, charity and community events. If you think the Cholsey & Wallingford Concert Band may be suitable for an event you are organising, please get in touch.